The correlation between the price of oil and other energy sources such as gas, coal, uranium and wood, is obvious. But the correlation between oil and agricultural production such as rice, wheat, soybeans, sugar cane, corn or cotton is often ignored. Yet agricultural materials have similar fluctuations to those of oil. In 1998, the oil price has reached its low point ($ 10 a barrel...), after a downward cycle of 17 years. Since the oil price has changed, then there is an upward trend in long-term strong. In 2008, when oil is at its highest ($ 145 per barrel), soft commodities follow exactly the same path. 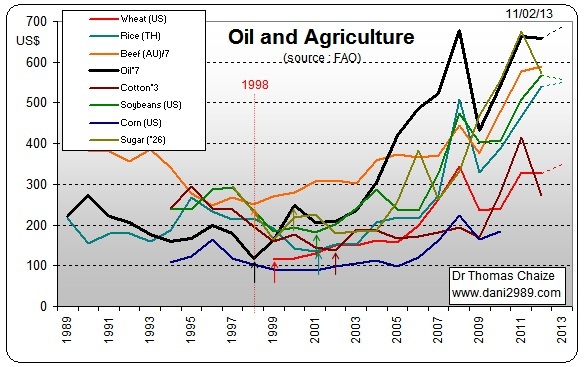 During the crisis, the correlation is identical downward, all agricultural materials down at the same time as the price of oil. Rising agricultural products will at least keep the oil that is in an uptrend long-term peak production. This is a minimum, because oil is the main factor bullish for global agriculture, but not alone. The increase in population (increase in demand), the use of biofuels (oil-related), the falling dollar (weakening of the unit of measurement), water resources (geological depletion, pollution, poor managements), climatic (droughts, floods, climatic changes), soil depletion and declining agricultural land (urbanization, desertification, erosion) are all bullish factors for wheat, rice, soybeans, corn and cotton. Oil is, directly and indirectly, the most important variable. It is for this reason that when the oil exceed historical levels in July 2008, cereals, fruits, vegetables, meat, edible oils are also at record levels. I have the same degree of optimism for agriculture today as gold and oil in 2001. Such as cotton, corn, wheat, soybeans, sugar cane or corn will go from record to record this decade. This does not prevent cuts short and violent characteristics of bull markets, but the upward trend will continue. Aids and various subsidies will gradually move from farmers to consumers. In a bear market, the aid goes to producers (farmers), in a bull market will aid consumers (world population). The rising price of wheat or rice, which are staple foods require subsidies to feed a growing world population. Wheat, for example, after five decades of decline, the trend changed in 2000, the downtrend is over. We are now in a structural bull market for wheat (note the two large peaks in the first and second oil shock...). When students most prestigious universities follow the advice of Jim Rogers and choose to specialize in agriculture rather than finance, then you should worry.